There are an awful lot of blockchain startups, and most of them will fail"
In the world of blockchain, six years is somewhere close to an eternity. In 2012, the term 'blockchain' would have been unfamiliar even to many people working in the tech-driven games industry. In 2012, Bitcoin was barely out of its proof-of-concept phase. 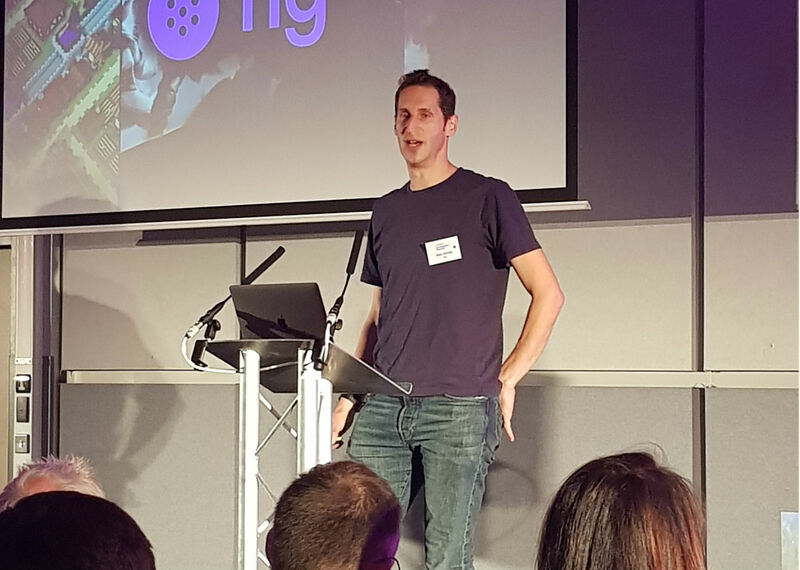 And yet that's when Alex Amsel, now leading blockchain strategy for Fig, started immersing himself in the technology's rich potential. "I've seen the booms, the busts, the thefts, the arguments," he said, speaking at the GamesIndustry.biz Investment Summit last week. "All sorts of crazy stuff, to be honest." Amsel opened his talk with a crash course in blockchain, using the analogy of, "the modern version of an old, classic ledger." Where every line in a ledger was the written record of a sale, each block on a blockchain represents digital data recording similar transactions. The main difference, he said, is that where a "master ledger" would be the property of a bank or company, nobody owns a blockchain. "If anyone remembers the dot-com boom and bust, this will be very, very similar"
"Everyone has a copy of the same book... And through some clever game theory, nobody lies or cheats and claims that their copy of the book is different, that their one is true and everyone else's is wrong," Amsel continued. "Because people get paid to agree with each other, and since everyone is anonymous the only rational thing to do is to tell the truth - in theory. People have argued about this for a long time, but it has proved to be correct." Over the last 12 months, journalists covering the games industry have been forced to grapple with blockchain technology, simply to keep up with the number of startups moving into the space. Amsel showed the audience a slide with the logos of "just some" of these new businesses, most of which are feeling their way through a market that has yet to take any kind of shape. "There are an awful, awful lot [of blockchain startups], and most of them are going to fail," he said. "If anyone remembers the dot-com boom and bust, this will be very, very similar. "But out of this will come some really interesting stuff. Out of this will come a new Facebook. Out of this will come a new Twitter. Out of this will come a new bank. And out of this will come really good, new gaming technology." The most disruptive effect of blockchain technology will relate to the ownership of digital items. The impact of this will be felt far beyond games, Amsel said, but it is already the most popular area of focus for new games businesses working with the technology. "When you buy something online now, digitally, through your iPhone or through Amazon, the content isn't yours," Amsel said. "When you buy that book for your Kindle, that book can be taken away from you... It's quite a problem; people don't know their rights, and they don't really have many." "I'm absolutely certain that new services will be created based on this principle of true ownership"
"I sold an item to you, you now own the item. You sell that item to your friend, they now own the item," Amsel said. "It's no different from sending money [as Bitcoin]. It's just an item instead. "Having looked at this for a long time, I'm absolutely certain that new services will be created based on this principle of true ownership. They will offer unique opportunities to everyone involved. Everyone will find a better way of doing things. It's not going to work for everything. It's not going to replace every game and every app store, but it will help in some cases." Among the consequences of true digital ownership will be the value attached to scarcity. When someone buys a physical art print, Amsel said, they can know if it's one of only 20 that exist in the world. Blockchain technology would give the same assurances for digital items sold and traded online, with the added advantage of not needing an expert to verify the item as one might with a physical object. "You could prove it on ebay, on social media, anywhere," he said. "We already know that people value rare or scarce items in the physical world. Of course they're going to do it in the digital world. We already see it in a few examples, and we can mainstream that. "[Blockchain] software can show that this is the magic sword used by Bill Gates on World of Warcraft, or whatever it happens to be. Or that this is the item created and given away by a YouTube celebrity or esports star... No expert required." In theory, Amsel explained, these owned items could be used across different games from different developers. He offered the example of two games based on the world of Star Wars (or Marvel, to use another of his examples), each created by a separate studio. "In order to complete an objective in game B, you might need a key from game A," he said. "Both games could sell the same items, which could be created by different game developers, by [video game content] creators." "It might be five to ten years before we see it go mainstream, but then something will do it in the same way that Minecraft did"
The most intriguing aspect of blockchain in terms of games doesn't relate to items bought within games, but to the purchase of games themselves. Amsel gave the example of buying a copy of Doom in 1993; if it were recorded on the blockchain that sale would still translate to ownership today, or in 20 years time should the franchise be resurrected again. "I can still prove it's my own Doom," he said. "So if someone resurrects Doom in ten years time, they can say 'if you've got the original Doom we can give you loads of extra stuff', or 'you can participate in the alpha'. That gives those copies of Doom more value." Though Amsel didn't make the point, it would also weaken the position of platform holders who have previously required their customers to purchase multiple copies of the same product to play it on new systems - services like Nintendo's Virtual Console, for example, or backwards compatible Xbox games. In the "internet of property" that Amsel believes blockchain technology will create, that digital copy of Doom will be yours to play separate from the rise, fall or whims of any individual platform. This potential is exactly why Ubisoft is working with blockchain companies in its Station F incubator, and why "Asian companies" are making serious investments in the space. "They're all interested, because they know it's the future," he said. "They just don't quite know how, so they're trying to know what it is." Amsel finished with a slide highlighting the key companies working with blockchain in the games industry. However, he admitted that "I don't particularly rate" anything on the market at present, save for Animoca's CryptoKitties - a "completely decentralised game" through which "million of dollars" have flowed over the last nine months - and Loom Network's Zombie Battleground, which raised more than $300,000 through a Kickstarter campaign. "Blockchain is really, really early stage," Amsel said. "Don't judge anything about it from what's there now. Don't judge the games, don't judge the technology. We know what's possible, but we don't know the best way to use it... We need the projects to prove themselves, but there is space there for innovative developers to do something in the next couple of years. "Longer term, it might be five to ten years before we see it go mainstream, but then something will do it in the same way that Minecraft did."